Adam, an unemployed actor, is waiting for his big break although all his agent has found for him is an audition for the role of a washing machine. Much to his surprise, he lands a starring role but it suddenly slips away into the hands of superstar Moshe Ivgy. Shir is the best soccer player that anyone has seen in years. The final game of the season is taking place the day after tomorrow. She simply has to succeed although it is common knowledge that, at the moment of truth, she will probably panic and literally wet her pants! Victor is an ex-con who has just been released from jail. He decides to pack up his stashed millions, and his girlfriend Lena get as far away as possible and turn over a new leaf. However, his past reemerges repeatedly, causing him to change his plans at every turn. 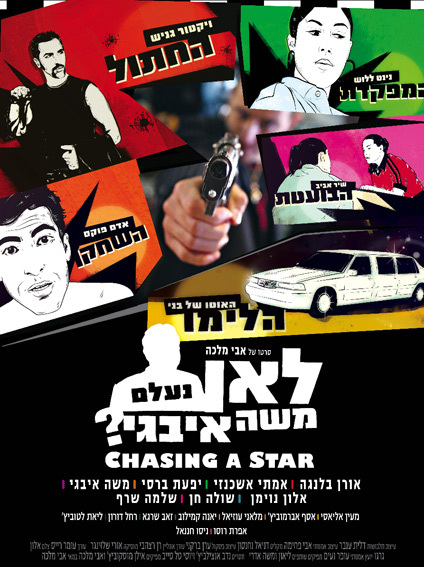 "Chasing a Star" (Who Kidnapped Moshe Ivgy?) is a stylish crime comedy telling the stories of three small character who only want to follow their dreams.